Bike spanners were often supplied with a bicycle for the customer to maintain the bike. The spanners were custom-made to suit the specific requirements of the bike and typically fitted hubs, brakes, seat or handle bars. Bicycle Block Spanner by Becon, a German company - Beck & Coram were the Australian agents. 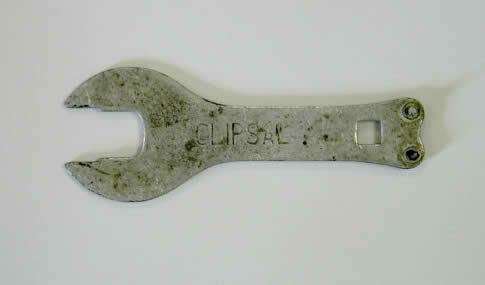 Clipsal Cone Spanner - fits brake cone on hub type brakes - vintage 1930s. Image courtesy Gerard Industries P/L (Clipsal) in South Australia. Durham Australia, Dogbone Bike Wrench - diecast.